I have decided it is time to start dedicating time to breakfasts. During the week everyone is busy, there is no time to make a special breakfast, so I told my family from now on Sunday mornings I am going to start trying new things, something a little more special. So for my first special breakfast day I have decided to make Eggs in Purgatory or Hangover Eggs. I have been meaning to try this for ages as I saw it in a cookbook and thought my family would love it. 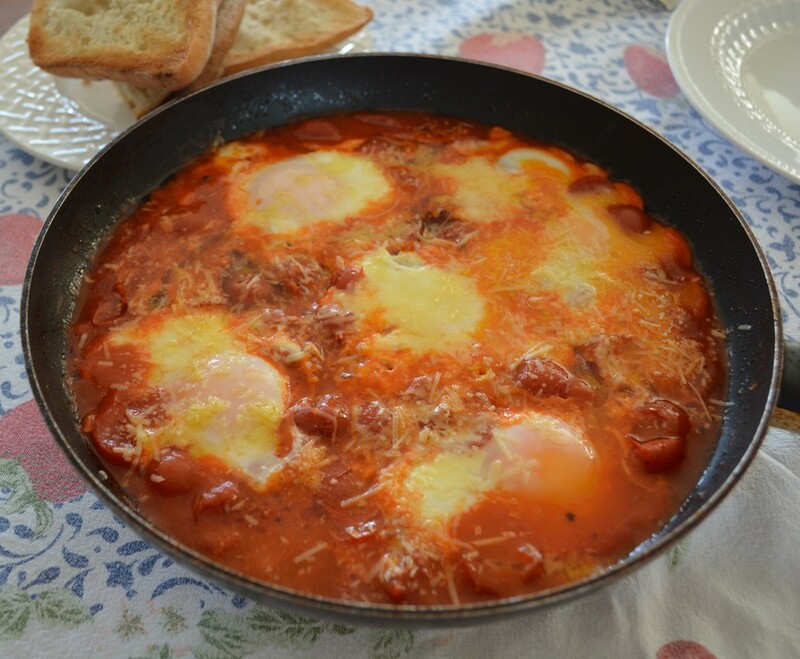 It is a spicy tomato sauce that is put together in minutes, then you crack eggs into the tomatoes and you poach them for about 5 minutes and that's it, in a total of 10 minutes you have one of the most delicious breakfasts on the table and everyone is mopping up the sauce and eggs. I assume it is sometimes referred to as hangover eggs as after a night of partying, you can put this together quickly and easily. So you have a delicious breakfast with very little effort involved. Now I made this twice today, firstly i made it for my husband, teenage son and for me, I made it as per recipe and we loved it. Then my daughter asked if she could have some (as she slept in) so I made hers but this time using half quantities and this time using tomato passata and a few fresh cherry tomatoes which I squashed into the passata. For hers I used only two eggs, she was joined for breakfast by my 10 year old who added extra Tabasco sauce for even more heat. I used a 20-22cm (base measurement) round frying pan for this recipe and when I halved the recipe when making it for my daughter I made it in a 15cm frying pan. It is a recipe that can easily be doubled or halved. You can add as many or as little eggs as you like. With only a few pantry items needed, this breakfast is so easy to make and so quick to make you have no excuse not to make this. But don't limit it to breakfast, this works as a quick and easy lunch and dinner to. Pour the oil into a frying pan. Place over a medium heat and add in the garlic and chilli flakes. stir for 30-60 seconds or until you can smell the garlic, but don't allow it to brown. Add in the tomatoes, give it a good stir to mix the oil and tomatoes together, season with salt and pepper and allow to start to bubble, it has to be hot enough to poach an egg in. 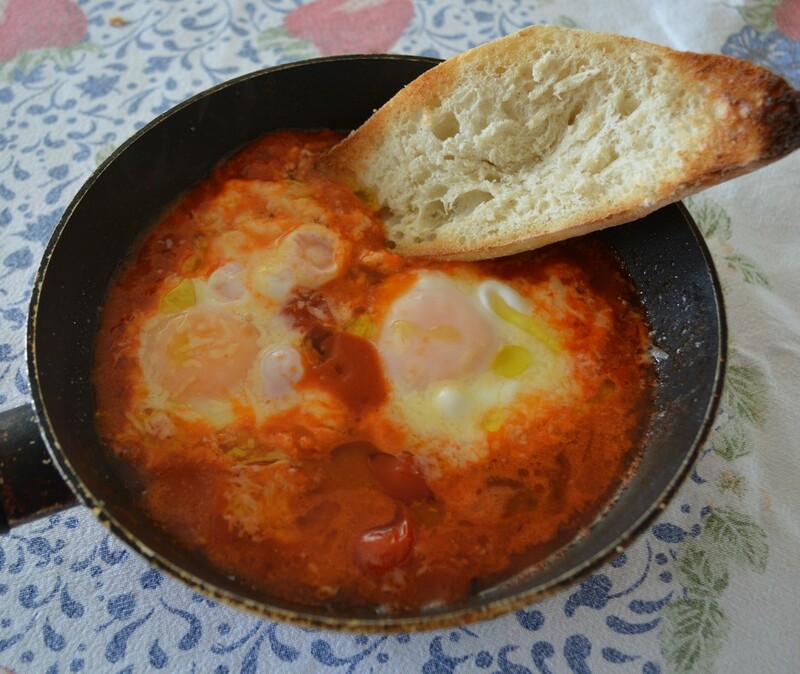 Crack an egg into a bowl and carefully pour it over the tomatoes, repeat with the remaining eggs. Make sure you leave the yolks exposed. Sprinkle with the parmesan cheese, and partially cover with a lid Let it bubble over a low heat for about 5 minutes, by which time the whites should have set and the yolk is still runny, start checking it at 4 minutes though. Remove from the heat and serve with a fresh sprinkling of grated parmesan cheese, a drizzle of extra virgin olive oil or chilli oil if you love even more heat and some crusty Italian bread to dunk into the sauce.